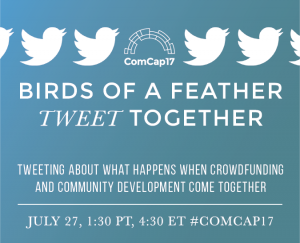 Join us for the #COMCAP17 Twitter Chat on July 27! You’re invited Thursday, July 27th for a pre-conference “Twitter chat”, to share your 140-character thoughts on all things community capital! Join the ComCap17 team, representatives from NC3, the National Coalition for Community Capital, and many speakers, attendees and organizational partners on the afternoon of July 27 for 30 minutes of connections and idea sharing. 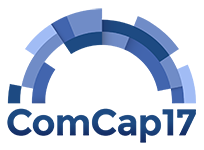 WHO: Anyone heading to the ComCap17 Conference or interested in learning more! -What is community capital to you? -Why is it important to talk about where your $$ goes? -Why does local money matter? -What is your experience with being “locally invested”? -How do you invest locally? -Why are you coming to the conference this year? -What speakers are you excited to hear more about? -What’s the future of community capital? Check out the full conference program and our press releases for more information on what’s in store.